Atlanta is a city that seems like it is constantly rebuilding itself. So it’s always a pleasure to see genuinely old buildings like Tech Tower at the heart of the Georgia Tech campus. This impressive old building is commonly referred to as Tech Tower but is officially the Lettie Pate Whitehead Evans Administration Building. This historic landmark is one of the first buildings built at Georgia Tech. Construction was completed in 1888. As you can see from the details in this artwork, it includes elements of Gothic Revival architecture as well as some Romanesque influence. It’s a beautiful fairy-tale style structure by today’s standards. I don’t know about you but it surprises me that the beautiful Tech Tower is not currently part of the logo representing Georgia Tech. The much more modern Kessler Campanile built for the 1996 Olympic games has that honor. I’m sure it’s walking a tightrope branding any college or university. Do you highlight the heritage or go for a dynamic modern forward-seeking look? Both have their values. Of course, being fond of historic architecture and history, you know which side I fall on even if I can appreciate both views! Classic architecture like Tech Tower talk to me. I imagine all the past students who have come and gone while that iconic building stood watch over them. It’s a bit romantic I guess, but I love the continuity. There’s a feeling of being connected to the past, present, and future. There are generations of stories connected to this place – the stories of students and faculty, their families, and so on. Do you feel the same about heritage architecture? I would love to hear what this Georgia Tech print says to you? Does it remind you of your years spent at Georgia Tech in Atlanta? Perhaps your parents or grandparents attended and it reminds you of multiple generations of your family? Or perhaps you’re looking for a gift for a loved one who has a history at Tech? Does the warm red and picturesque skies capture your attention? Do take a moment to pause and share your thoughts about what makes this the print for you! 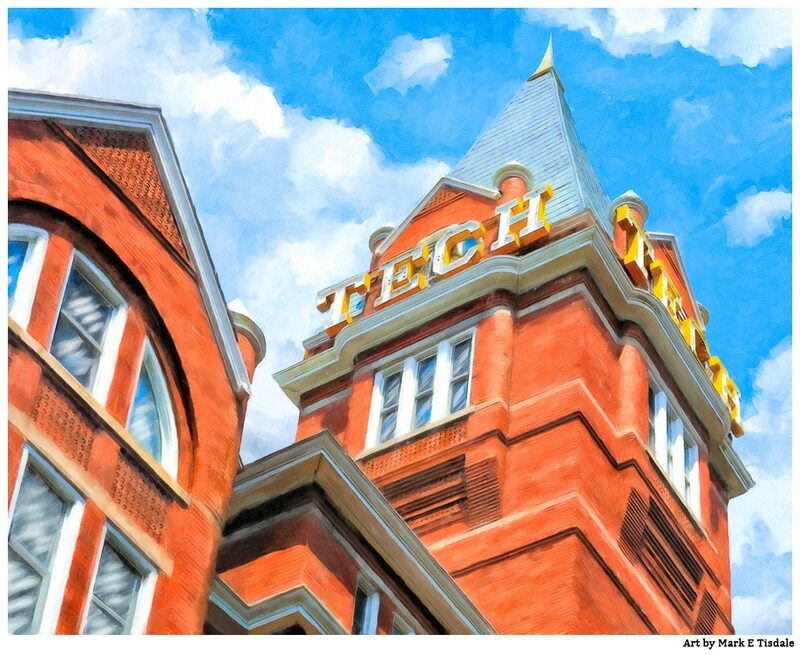 Note: Tech Tower along with other buildings at the core of the old campus is registered US Historic District.